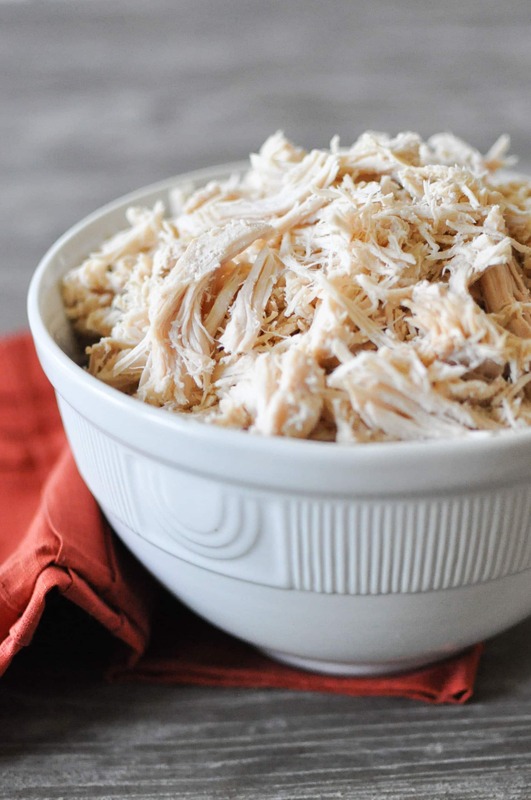 Slow cooker shredded chicken has 2 ingredients and yields 5 lbs of cooked chicken that can be easily repurposed for multiple meals throughout the week! 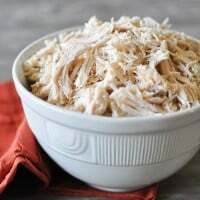 Not owning any diamonds of my own, I’m here to say that slow cooker shredded chicken is a girl’s best friend. 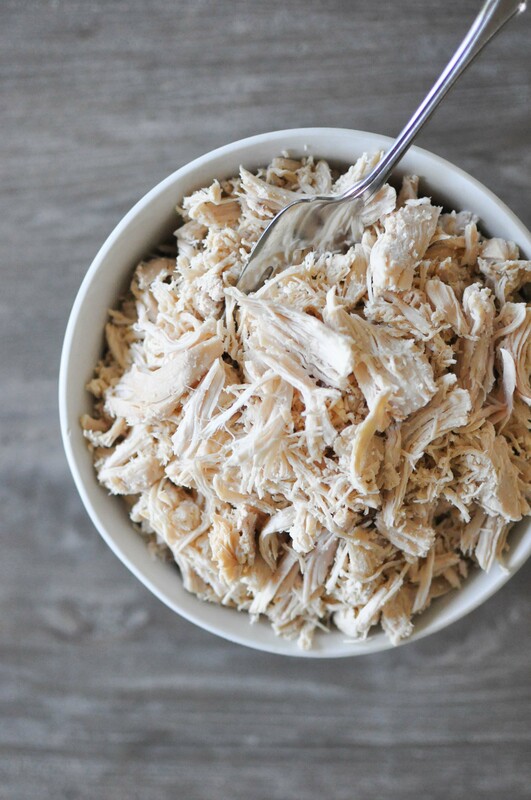 Nothing makes me happier than to open my refrigerator when I’m desperate with a “what am I going to make for dinner” panic, to find a bowl of already prepped shredded chicken. 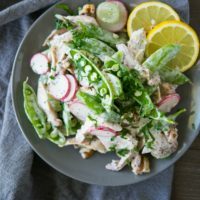 Three totally different flavor profiles, three dinners your family will love, and three meals that you’ll find are really simple to whip up. 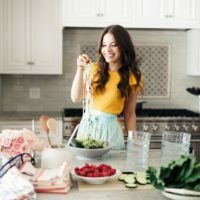 The key to making meal prep a healthy, not overwhelming, pleasant experience is to try and thread the same ingredients through multiple meals. Last week we talked about how Basic Cauliflower Rice is a great meal component to make in advance, and in bulk. As you'll see in two out of the three dinners above, cauliflower rice and shredded chicken work well together. Sprinkle 5-6 lbs (12 breasts) of chicken with a little salt & pepper. Plop them all in your favorite slow cooker, cover with water or broth, put a lid on, and let it cook on medium for 6-8 hours. When it’s done, pull the chicken from the broth and effortlessly shred with two forks. That’s it, folks! Pretty simple way to meet your week’s protein needs. 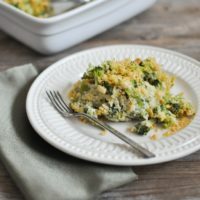 I hope you find this recipe as useful as I do! Dust the chicken with sea salt and black pepper. Lay all breasts in the slow cooker. Add the broth, place lid on top, and cook on medium for 6-8 hours. Pull the chicken breasts from the liquid and place in a bowl. Using two forks OR the paddle attachment on a stand-mixer, shred the chicken. Store in an airtight container for up to one week or freeze. Dust the chicken breast with sea salt and black pepper. Working in two batches or with two separate pans, melt 1 tablespoon of butter. Lay the chicken breasts in the hot pan and sear on one side for approximately 3 minutes. Flip the chicken breasts over to sear for an additional minute on the other side. Cover the breasts with half of the chicken broth, using water to make up any difference. Place lid on pan and let them simmer for 15-20 minutes. Repeat for the second batch. Do you use boneless, skinless breasts or whole breasts with skin on? Hi Cheryl! I usually opt for boneless, skinless breasts. If there is no medium setting on my crockpot, what is the best approach to cook this? I am already 3 hours into cooking the chicken and just started it on high. Turned it to low for about an hour and now back to high. Realized that might be a bad idea. You could cook it on low for 8-10 hours OR your method might work, too! Test to see if they’re ready to be shredded by poking with a fork and trying lightly to pull them apart. If they start to separate easily, then you’re done. Mine came out perfectly, I’m excited to try the 3 recipes this week! Can you use the leftover broth for a soup or something? I’m not am expert cook, but I feel like it’s going to waste! So glad it came out for you Colleen! And yes, use the leftover broth for whatever you like. If you can’t find a use for it right away, you can freeze it in ice cube trays and then have it handy whenever a recipe calls for broth. If using water will it still taste ok! ?Realized didn’t have any broth on hand! Yes Jennifer that would work fine! I would just suggest adding some additional spices for some extra flavor. I tried making this quickly: 4 hours on high. It came out very dry. Please don’t make this mistake like I did! I will try cooking it for longer on low next time.